Sometimes it's hard to find a good co-op partner. Work, school, family, friends, time zones, and work (I know I mentioned it twice) are always conspiring to hinder co-op play. What's an adventurous gamer to do? The makers of Torchlight 2 have a solution: bring a pet. Okay, familiars and pets are nothing new, but developer Runic Games has added a few new backpack-laden creatures to the mix. They all seem pretty cute a cuddly with one notable exception. *cough* chakawary *cough* The following video shows the pets... well, not really in action. They're kind of just lounging around doing nothing. Heck, if that's all it takes to be a pet in Torchlight 2, the pugs snoring at my feet could make the cut. I hope these creatures are a little more fierce when called to action. Check out the video. Aren't they cute? 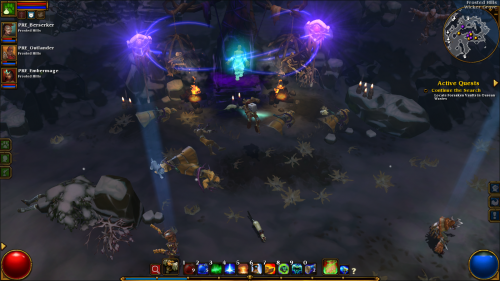 Torchlight 2 supports at least four player online co-op. It should be coming to PC sometime this year. Hopefully we'll get some more info and hands-on time at PAX East this weekend.